New Mexico’s pet-friendly lodgings are as charming as your four-legged friend. When my bulldog, Travelin’ Jack, hears me say, “Let’s hit the road,” he knows another dog-friendly adventure is afoot. And we’re not alone. Over 58 percent of U.S. households consider their pets to be family members and travel with them. Accordingly, more lodging facilities are rolling out the canine welcome mat, and along with the usual pet-welcoming chain lodgings, New Mexico also offers a wealth of options, from swanky resorts to cozy cabins. Here are a few of our favorites. Thirty-eight of 39 lodges and all 29 RV parks welcome pets in this southern county known for its bodies of water. First-class, pet-friendly accommodations await at Elephant Butte Inn & Spa. The staff at this lakefront resort welcomes pets with treats at check-in. Comfortable rooms, each with its own front porch, offer either lake or mountain views. The adjacent RV park has a self-serve doggie wash. From $80, with a $15–$20 pet fee (575-744-5431; ebresort.com). Historic Pye Cabin, an 1878 log-cabin-turned-vacation-rental in the mining town of Chloride, offers charming pet- and family-friendly accommodations—including a fenced-in picnic area—without an additional pet fee. From $100 (575-743-2736; pioneerstoremuseum.com/Pye_Cabin.html). In Truth or Consequences, share a spa getaway with your pet at Firewater Lodge, a retro motor-court motel. Enjoy a private in-room hot-spring soak while your dog rests nearby, or relax together in the outdoor courtyard. From $90, with a $10 pet fee (575-740-0315; firewaterlodge.com). T or C’s three-star Sierra Grande Lodge offers several pet-friendly units. Here your dog can join you at breakfast on the outdoor patio, and sit spa-side while you soak in the outdoor spa. From $99, with a $25 pet fee (575- 894-6976; sierragrandelodge.com). Stroll along the Río Grande in Ralph Edwards Park, and then enjoy a hearty sandwich on Happy Belly Deli’s pet-friendly patio dining area (575-894-3354). Rocky Mountain adventures await at Golden Eagle Lodge. This comfortable property is conveniently located to everything in and around Red River. Their picnic-and-play area is ideal for all-inclusive family picnics, and every unit is pet-friendly. It’s fine to leave well-behaved pets in-room, and all furry guests receive a goody bag. From $65, with a $25 pet fee (800-621-4046; goldeneaglelodgeredriver.com). Rio Colorado Lodge offers pet-friendly mountain cabins. Set riverside on five acres, with great roaming opportunities for everyone. From $60, with a $25 pet fee (800-654-6516; riocoloradocabins.com). Pet- and family-friendly activities abound in this charming Old West town. At Enchanted Forest Cross Country Ski Area, pets are welcome all seasons on their 5K pet-designated trails. Pets can play downtown along the river, and at the town’s centrally located Brandenburg and Woerndle parks. Slopeside dining at Red River’s Ski Area Lift House is also pet-friendly year-round (575-754-2223; redriverskiarea.com). This standout chain property has been ranked the second-best Comfort Suites in the U.S for the third year in a row—and it might just be Gallup’s most pet-oriented property. The all-suites hotel welcomes dogs, cats, and birds. Pets may be left crated in rooms, if guests provide Reception with a cell-phone number. Bonus: The hotel will waive the pet fee if you mention Travelin’ Jack’s name. From $90, with a $15 pet fee (505 863-3445; comfortsuites.com). During the heyday of cowboy westerns, movie stars called El Rancho Hotel & Motel home. Today, this 1930s-vintage hotel welcomes pets and doesn’t charge a related fee. Browse the property’s historic photo gallery with your dog. From $81 (800-543-6351; elrancho.com). Shop with your pet at Richardson’s Trading Company, Gallup’s iconic Native American trading post, gallery, and museum, all rolled into one giant experience (505-722-4762). Enjoy a leisurely stroll with your pet down the Mother Road, Route 66. Bunk in style at the centrally located Eldorado Hotel. This full-service property rolls out the red carpet for pets, with a specially prepared welcome gift for all pre-registered animals. Beautiful public areas adorned with world-class artwork provide abundant opportunities for exploration, and your pet can be left unattended in the room. From $189, with a $50 pet fee (800-955-4455; eldoradohotel.com). Buffalo Thunder Hilton Resort offers everything for the discriminating pet traveler. Numerous paths meander around the resort, and the resort’s dramatic lobby and concourse provide stimulating walking areas. The grassy courtyard includes a convenient pet station. From $89, with a $50 pet fee (877-455-7775; buffalothunderresort.com). 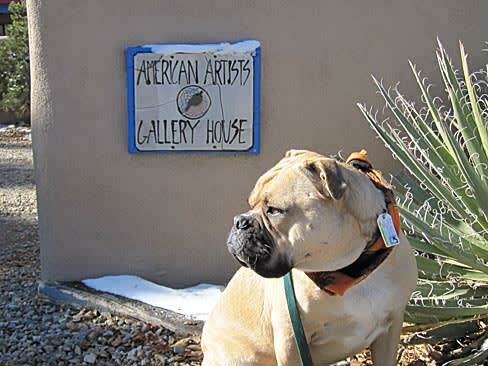 Canyon Road’s pet-friendly galleries include eclectic cowboy and folk-art gallery Ed Larson Studio (505-983-7269; edlarson.com), and contemporary Darnell Fine Art (505-984-0840; darnellfineart.com). Well-mannered pets are welcome at The Tea House patio (505-992-0972; teahousesantafe.com). Zoey and Guido’s Pet Boutique offers specialty foods, trendy collars, and pet attire. Your pooch can play in the community room while you shop (505- 988-2500; zoeandguidos.com). Seven miles north of Silver City in historic Pinos Altos, Bear Creek Motel & Cabins is one of the most unique properties in Grant County. Set on five lush acres, the charming bilevel cabins are tucked amid giant Ponderosa pines—some grow right through the porch! Wildlife viewing, hiking, and birding begin at your cabin’s doorstep, and each cabin has its own enclosed patio. Dogs, cats, birds, and even a potbellied pig have vacationed here. From $109, with a $10/day fee per pet (888-388-4515; bearcreekcabins.com). Hungry? Diane’s Bakery & Deli welcomes pets (575-534-9229). Note: The nearby Gila Cliff Dwellings National Monument does not allow pets on its trails, but provides a kennel. Leashed pets are permitted on National Forest trails. The American Artists Gallery B&B is a gem of a find for artsy pet-lovers. Their desert-garden courtyard welcomes you to this well-appointed Southwestern adobe hacienda. You and your leashed pet will enjoy watching George, the resident peacock, strut around the property in style! From $99, with a $25 pet fee (800-532-2041; taosbedandbreakfast.com). Taos’s historic Sagebrush Inn offers a western cantina and cozy suites outfitted with kiva fireplaces, hand-hewn vigas, and local art. The rooms in their pet-designated compound open onto grassy lawns. From $89 with a $7/night pet fee (800-428-3626; sagebrushinn.com). In town, enjoy dog-friendly Kit Carson Park, 10,000 Wags Pet Resort and Boutique (575-751-9247; 1000wags.com) for day care and goodies, and Graham’s Grill by Lesley B. Fay (575-751-1350; grahamstaos.com), which mainly caters to humans but offers a $4 Yappy Hour Menu for pets (includes entrée, vegetables, and water). Your dog will luxuriate at Albuquerque’s Bottger Mansion B&B, in Old Town. At this Victorian property, a comfy pet mat and Welcome Treat Bag are hand-delivered on check-in. The beautifully groomed garden is perfect for sniffing around, and includes a designated “doggie business area.” From $149, with a $50 pet fee (800-758-3639; bottger.com). The recently renovated Hotel Andaluz, in downtown Albuquerque, offers top pet amenities in its grand, historic Spanish setting: pet beds, a pet-friendly guide to the neighborhood, and access to the Rooftop Lounge and main lobby lounge area. From $139, with a $50 pet fee (877-987-9090; hotelandaluz.com). From April 1 to October 31, explore the Duke City via one of ABQ Trolley Co.’s tours, in an open-air trolley that welcomes dogs and their owners (505-240-8000; abqtrolley.com). Make sure to stop at Three Dog Bakery, a bakery just for dogs (505-294-2300; 3dogbakeryabq.com). And Church Street Café’s two outdoor patios welcome pets and their owners (505-247-8522; churchstreetcafe.com).